This weekend's almost unending rain paused this Saturday between 2pm and 5pm for the 65th Annual Albury Produce Show and gave Surrey's fete goers a much needed taste of Summer. The Albury Produce Show was founded in 1946 and is one of the oldest shows of its kind in the country. 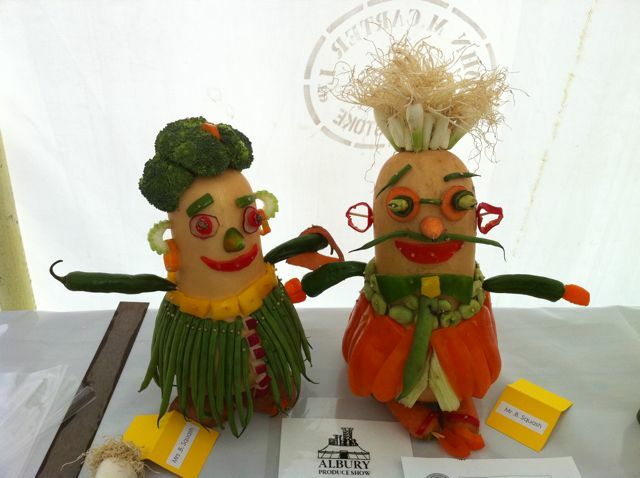 There was a whole variety of prize vegetables, fruit, flowers, cookery, photography and much more entered into the 219 different competition classes in the produce tent. Outside there was live music from the Heslemere Town brass band, Morris dancing from the East Surrey Morris Men, classic military vehicles, a host of stalls, teas, cakes and a hog roast. Proceeds from the event go to a selection of local charities. Last year the organisers raised over £4,000 with the principal beneficiary being Cherry Trees in East Clandon, which provides respite care for children and young people with learning and physical disabilities. Following Saturday's Produce Show, Sunday saw the third Albury Free Festival a live music event featuring a great line up of local bands playing Rock, Blues and Jazz.